Anyone who's ever fantasized about being an extra in the Scottish wedding scene from Four Weddings and a Funeral will simply love this little ship -- it epitomizes old fashioned British style at its very best. Carrying just 50 passengers and designed to resemble a country house at sea, Hebridean Princess is literally fit for a queen -- HM Queen Elizabeth II has sailed on her -- twice. The British monarch chartered the vessel in 2006 for a cruise to celebrate her 80th birthday, and again four years later. There is also a signed portrait of her and Prince Philip behind the Reception desk and a huge Royal Charter ("By Appointment to...") in the Lookout Lounge in case you didn't realize. Hebridean Princess has a fascinating past: built in 1964 at the height of the Cold War, the ship was the third of three sisters (the others two were MV Hebrides and MV Clansman) originally designed as command centers in the event of a nuclear war. Originally named Columba (the Dining Room makes a nod to this past), she has inch-thick steel in the hull, a decontamination chamber and outside sprinklers to rinse off radiation. She also has her original stabilizers -- unheard of in a ship this old. Columba went straight into service as a Caledonian MacBrayne car ferry plying the Isle of Mull route with vehicles loaded on by crane. In 1988 she was acquired by Hebridean Island Cruises, who began transforming her from an intra-island workhorse into the gorgeous mini country house at sea she now is. The ship still carries a few ghosts of her ferry past -- notably quite juddery engines and an old-fashioned forced air system of air conditioning via pull-down plates in the ceilings -- but these are minor issues, more than compensated by her uniqueness and exclusivity. This exclusivity does not come cheap, however: for example a seven-night June 2014 sailing "A Hebridean Overture" from Oban via Jura, Islay, Iona, Muck and Mull costs from £4,370 in a tiny single cabin to £10,040 per person to share the top Isle of Arran suite. But if you want to see Bonnie Scotland in unforgettable style, this is the way to do it. In this frantic, wired-up, high-speed, connected world, Hebridean Princess harks back to a bygone era, where simple pleasures define the experience: a heart-stopping view, fresh local fare, convivial company and old-fashioned luxury. You'll meet everyone from peers of the realm to retired company directors, doctors and lawyers. Ninety-five percent are Brits, all are well-heeled (they have to be to afford it), but the atmosphere is friendly and pleasant, with little social vying. Famous past passengers include retired race driver Jackie Stewart (who hired the ship for his wife's birthday, which included a performance by Chris de Burgh), Princess Anne, and Sean Connery (who, legend has it, disembarked after two days because "James Bond got seasick"), and of course the most famous of all, HM The Queen, who chartered the ship -- twice. Black tie is not obligatory at the gala dinners but most passengers do wear it. Passengers dress smartly for dinner, and some Scottish guests wear full Robbie Burns rig on the night that a haggis dinner is served. A golden rule is that understated good taste rather than sequins is the order of the day. The Royal Crown was built in the Netherlands in 1996 and originally launched as the River Cloud. 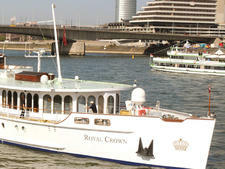 After a full refurbishment in 2009, she returned to the waters under the name Royal Crown, looking better than ever.